For some time I had been meaning to visit both Wat Chalermprakiet and the Khun Tan Station, but somehow never got around to it. With an impending GT.Rider (fab website and forum for rider info) meetup planned in Lampang (close to both the temple and station), I decided it was a good excuse to finally visit these places whilst also getting a chance to catch up with rider friends. My plan was to head to the temple on day one, then ride to Khun Tan Station the next day. Keep in mind that the Chae Son (recommended) route will take longer and can get slippery in Rainy Season. Ignore the time estimation on google maps, this route WILL take longer due to the road conditions and the scenic value. Additionally you could turn it into a loop via the main R118 (and returning via the R11), or take the various back roads and side roads. There is so many interesting places to explore around here, that the combos are endless! I set of on a late (rainy) morning ride down the R11 from Chiang Mai to Lampang. I avoided Lampang city and headed north on the R1157 towards the temple. Not a great choice of road as it cut through a lot of villages, but on the plus side it had stopped raining. As I was riding along the 1157 I spotted a side road leading to the temple that is not on google maps. So I took that road, and that’s when I finally started to enjoy the ride. In my map guide I have just used the R4012 as reference, to make thing easier. If I return this way again I will make sure to mark the exact GPS location. This road was quiet and scenic and the stunning limestone mountain of Wat Charlemprakiet was in clear view. Built in honour of King Rama IV on top of a limestone mountain, Wat Charlemprakiet is a true wonder. 100 Baht fee for the return ride to the temple. Coffee shop and snacks available both at base of mountain and at the start of the trail up. Important note. If you have never been to this temple (like me), make sure that you stop at the small village area at the base of the temple road, rather than continue up to the smaller temple at the base of the mountain. This temple may as well be abandoned, as there is no one around and no signage telling you what to do. I stupidly rode up there and spent some time wandering around like a headless chicken wondering how to get access to the main temple. Anyway, I rode back down to the village area and that’s when i noticed the ticket booth. D’oh! I was informed that no private vehicles or bikes are allowed up the main temple route and that I would need to hire a driver. The cost for a return trip was only 100 baht, so very cheap really! I paid for my ticket and waited for the driver. Felt a little daunting to put my life in the hands of an unknown driver going up a steep mountain road, but the driver informed me that he had been doing this run for 18 years, and around 8 times a day! Not one accident! He did tell me of a BWM motorbike accident though. Apparently a big BMW bike fell down the mountain coming down from the temple. Rider was ok as they rolled off onto the road, but the bike slid right down and was destroyed. This is the only recorded accident he knows of. It took a while to get to the top of the mountain, and the driver dropped me off at the start of the walking / hiking point. (Just below this point was a small drinks and snack vendor, so that is good to know in case you forget to bring water). The ascent to the top of the temple was fairly steep. The steps were made from corrugated steel, but some areas were step-free and were just craggy root and rock bound sections and a little muddy. At around 400 – 500 meters it is a bit of a workout (some reports have it at as much as an 800 meter climb, but i believe it was around 500), especially on a hot and humid day (which by then it was). It is a steep hike in some sections, so not a trip for the faint hearted. The start of the walk up. Initially correlated steel steps, but gets steep and craggy later on near the top. Eventually I reached the the temple grounds and once I saw the view, I knew it was all worth it. Absolutely spectacular! There are two sections to the temple, so make sure to follow both paths. Each path leads to spectacular lookouts. Lots of bells and gongs on route too, so make them sing! After enjoying the view for a while I headed back down to the pickup point and called up the driver (who had given me his phone number prior to setting off). Was a nice ride back down and I knew I was in good hands. Back on my bike I checked for an alternative route into Lampang City. I noticed a reservoir on one route that would take slightly longer (the R1335), and decided that this one would most likely be a more scenic route. Turned out my hunches were correct and it was a fantastic road! Just three of us joined for this meet-up, but the conversation and company was great. I was the first to head back to the hotel though as I was feeling tired and a migraine was beginning to kick in from the air pressure. In the morning I checked out of the Pin hotel at around 9:30am, and went to meet my friend David Unkovich for coffee at Flat White Cafe. Opposite this coffee shop was the stunning Wat Chiang Rai, which begged for a photo op, so after great coffee and scones we headed over to the temple to get some photos. As luck would have it there were students at the temple taking photos, so was another great excuse for a photo op with them included too. They were absolutely wonderful and was a fun moment. After the photos I left David to take more photos in the city area whilst I headed off for Khun Tan Railway Station, (back on the main R11 highway again..Zzz). I made good time as this highway is pretty much straight boring riding, but at least it is consistently fast. I took the turn off for Khun Tan National Park (clearly signposted) and headed off to the station through rural villages. My first stop before Khun Tan Station was The White Bridge & Tha Chomphu Railway area. Saw this monk on the back of the pickup and villagers coming out to him to receive blessings. Looked so picturesque. Completed in 1920, this historic Western style steel bridge was constructed to cross the Mae Tha River. Originally the bridge was painted black but during WWII, but was painted white when allied forces considered bombing it to obstruct the Japanese railway route. Being white made the bridge hard to spot from the air, and prevented it being destroyed. Coffee shops and restaurants close by. The turnoff on the to the famous Tha Chomphu Bridge is clearly marked. There is a fab coffee shop near to the bridge and also small restaurants that line the riverside. I took a series of photos then set off to the crossover railway point near by. Was good timing, because when I arrived at the crossing point the barriers began to go down. I figured I was going to get some great footage of a large train passing. This is the sight that met my eyes… haha. Next I headed directly to Khun Tan National Park zone. 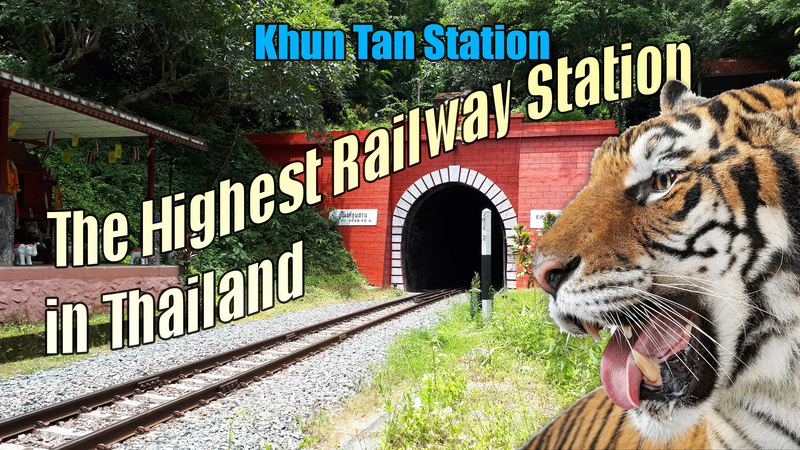 Khun Tan Railway Station is the highest train station in Thailand, with an elevation of 758 meters. The railway has a fascinating history to it with stories of tiger mauling’s, snakes and leaches and parasitic diseases. It links all the way to Bangkok, and the tunnel itself is 1362.10 metres in length, cutting through solid granite bedrock. The tunnel began construction in 1907 and was completed by 1918, during the reign of King Rama V. It became known as the Cemetery of Labourers, due to more than 1,000 workers having died during its construction, either due to accidents or disease. The labourers, who were mostly from Laos and the northeast of Thailand, were apparently heavy opium users and agreed to work on the project as long as their pay-packets were supplemented with opium. Emil Eisenhofer is the German railway engineer that was in charge of the Khun Tan tunnel, and his ashes are interred above the tunnel entrance. After the initial national park checkpoint i rode up until i reached the junction which leads to the national park headquarters (left) and the railway station (right). I took the path on the right and headed up the single lane route. Was interesting to finally see this picturesque station and tunnel, so sweet looking given it’s rather gruesome history. I had a walk around for a while before heading back on my bike and back down and out the park entrance. I did not take the left route to the national park this time, as will save that for another visit when I wish to do more exploring. This gives something to look forward to checking out later. Instead I took a leisurely route back to Chiang Mai, choosing to avoid the main highway as much as possible. I headed north on the R1230 then took the R1229, a road I absolutely loved! This was the most fun I had on all the roads I had been on this trip. Nice and twisty and very quiet. Had a bonus of a fantastic large white Buddha statue also. As I rode into Chiang Mai and into the city traffic I became a little disheartened at the heavy traffic which is so common place now. The air felt heavy with bustling city life. However, was good to get home as I had a bundle of fur looking forward to my return. Brilliant trip and I look forward to exploring more around this area.